In the past year or so, I think Clown Shoes has been dialed in when it comes to these massive barrel-aged beers. Years ago I thought most of them were too hot out of the gate and required some aging, but today, I think they are ready to go fresh off the line. I've stuck mainly to their imperial stouts, but now I'm diving into an interesting offering. 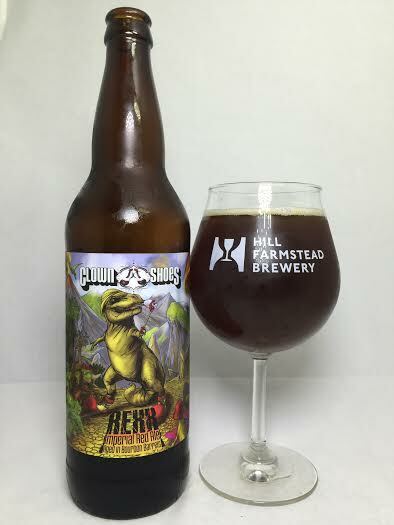 Rexx is an imperial red ale aged in bourbon barrels. I've never had a BA red ale, so hopefully getting my cherry popped with this experience is memorable. Pours an insanely murky dark red transitioning into a muddy brown. It had less than a finger of a dark egg shell or even yellowish head. The aroma shares the same characteristics with a lot of great English Barleywines, particularly of toffee and caramel. The bourbon is right there in your face and there's just a sprinkle of pine. A bigger malt presence is definitely noticeable on the first swig as is the obvious fact that everything from the aroma, while here and accounted for, is toned down several notches. I don't know what it is about the bourbon plus the red ale, but dark fruits, figs, and raisins are prominent and even dominating. The base red ale is here with notes of pine and some bitter hops. There's somewhat of a molasses flavor to this and it is actually reminding me of a well-made English Old Ale. The sweetness of the bourbon helps even out some of the more malty aspects and some nice oak lends even more barrel character to this. Mouthfeel for a big 12% beer feels a little thin. I don't think it makes great use of its weight, but it is not what I'd call watery. As I mentioned earlier, Clown Shoes barrel-aged beers no longer seem to burn with alcohol when they are fresh and this is proof positive of that fact as this has no alcohol taste and no heat or warming for such a big beer. Rexx retained the base Red Ale, but added several barrel characters. Oddly enough, it seemed like the finished product produced a completely different style whether it was Barleywine or Old Ale. In any case, there were flavor profiles pulled in from multiple styles with a big bourbon and oak kick which made this a complex brew. A thin mouthfeel held it back from reaching a higher level, but this is still another solid entry for Clown Shoes barrel-aged beers.